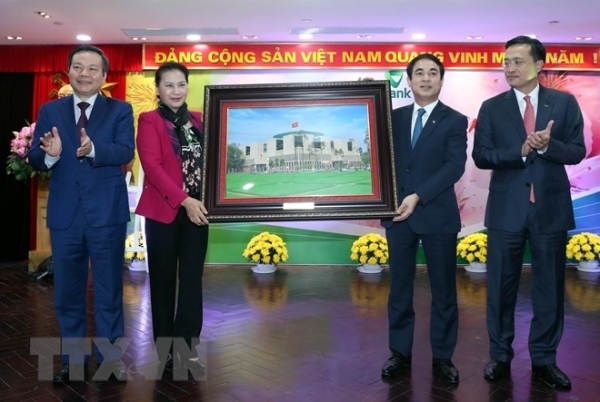 Chairwoman of the National Assembly Nguyen Thi Kim Ngan recognized the outstanding performance of Vietcombank in 2018 and wished the bank more success in the Year of the Pig during her visit to the bank on February 11, the first working day after the 9-day Lunar New Year (Tet) holiday. Speaking on the occasion, Governor of the State Bank of Vietnam Le Minh Hung praised Vietcombank as one of the best banks in Vietnam. The NA Chairwoman expressed joy at the assessment, which she said was proved by statistics that showed the bank’s pre-tax profit reached a record of nearly 18.4 trillion VND in 2018, the highest in the banking system in the country. The ratio of Vietcombank’s bad debt has also dropped to 0.97 percent. She urged the bank to build on its achievements and strive for sustainable growth, thus contributing resources to national development. The same day, the NA leader also paid a visit to the General Department of Vietnam Customs (GDVC). Recognising the customs sector’s efforts in deploying the national single window mechanism, Chairwoman Ngan said as the Standing Office of the National Steering Committee on ASEAN Single Window (ASW), National Single Window (NSW) and trade facilitation, the GDVC has actively advised the Finance Ministry in enhancing the effectiveness of inspections in the field, and assisted the Prime Minister in issuing a plan of actions to promote the NSW and ASW, reform the specialized inspections of imports-exports and trade facilitation for 2018-2020, creating a turning point in Vietnam’s administrative reform towards an e-government. She also hailed the customs sector in the fight against smuggling and trade frauds. Ngan urged the sector to continue expanding the NSW and ASW while performing well the functions of the Standing Office of the National Steering Committee on ASW, NSW and trade facilitation, along with its other tasks. Content responsibility: Director Doan Cong Huynh Copy Right: Authority of Foreign Information Service, Ministry of Information and Communications Phone: (04) 37676666 / Fax: (04) 37675959. Email: info@vietnam.vn License No. 20/GP-TTĐT for establishment of the general webpage on Internet granted by the Department of Radio, Television and Electronic Information on February 01, 2010. Copyright belongs to the Authority of Foreign Information Service (AFIS), Ministry of Information and Communication. It is requested to name "The Authority of Foreign Information Service" when information from this website is republished.